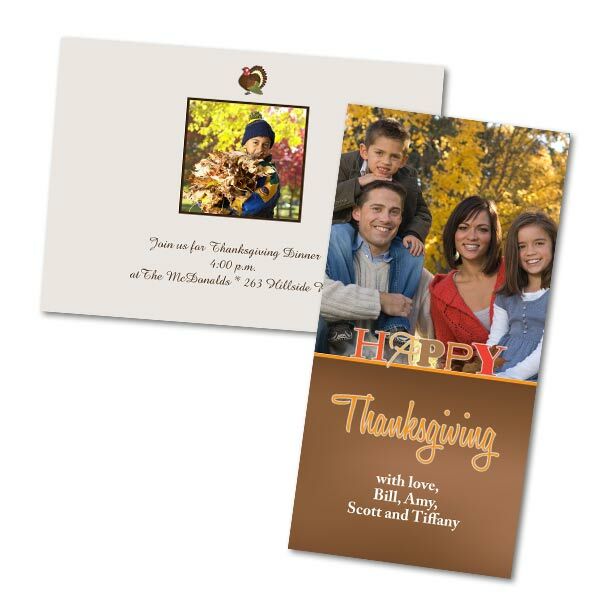 Plan your Thanksgiving holiday early and send a personalized photo card inviting friends and family for dinner. Thanksgiving photo cards are perfect for sharing the moment with those that could not be with you for the Thanksgiving holiday. Send your greetings, or share a family recipe, and have a Happy Thanksgiving Holiday. Most importantly, our customized cards let you share your best photos to liven up everyone's holiday experience. As a result, our Thanksgiving photo cards make great keepsakes that your friends and family will treasure for years to come. Thanksgiving is also the beginning of the holiday season. Get prepared now and start thinking about holiday greetings. We offer cardstock photo Christmas cards and Hanukkah greetings that you can personalize with photos and your own holiday message! Furthermore, our customized greetings come with complimentary envelopes so you can send them out as soon as your order arrives at your door. Also, be sure to check out our New Year's photo cards to close out the holiday season in style!